Want to know a powerful lead guitar playing secret? You can make your guitar solos much more expressive, by transcribing... vocal parts. 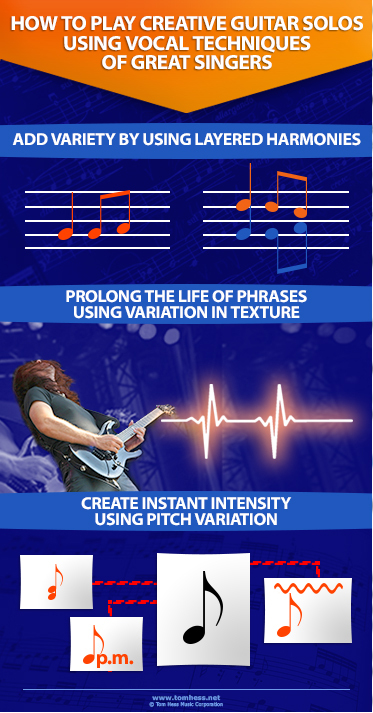 Transcribe vocal parts of your favorite singers and play them on your guitar. In part 1 of this article, you learned 4 ways to use King Diamond’s vocal style to improve your lead guitar playing. A harmony means: 2 or more melodies playing at the same time. It is a simple way to spice up your guitar solos. Layered harmonies make traditional harmonies a lot more creative (and they are simple to play). Now, pick up your guitar and get ready to practice. Step 1: Set a metronome to a moderate tempo (100-120 beats per minute). Record yourself playing note “A” on the 14th fret of the G string. Let it ring for 10 beats. Hear it. Step 2: Record note “C” on the 13th fret of the B string starting on beat 3. This harmonizes the “A” note from Step 1. The “A” note rings by itself during beats 1 and 2. Hear it. Step 3: Record note “E” on the 17th fret of the B string starting on beat 5. This creates the 3rd layer of the harmony. Hear it. This is a layered harmony that outlines a minor arpeggio (notes A C E). Instead of playing the notes all at once, you layer them on top of each other gradually. This guitar solo video gives you more ideas about playing emotional guitar solos. King Diamond uses many techniques to create variety in his phrasing (from growls to clean falsetto). He uses growls to create a thick melodic texture. Using high falsetto makes the melodic texture much thinner. Listen to the video from 35:11 - 36:01 to hear examples of this. Using double stops in your guitar solos mimics the growling effect of King Diamond’s vocals. Double stops are played by sounding 2 (or more) notes at once. This creates a much thicker melodic texture in your guitar solos. Note: Double stops are NOT only for blues (or classic rock) guitar playing. They can be (and often are) used in other styles, including heavy metal. The way you use the technique determines how your guitar licks sound. Double stops are not limited to "unison bends" (where you play 2 adjacent strings and bend one of them until both strings are sounding the same pitch). You can use double stops to create a harsh dissonance (that sounds awesome) and sustain it to build musical tension. King Diamond fluently mixes clean falsetto, growls, layered harmonies, delayed vibrato and other techniques. These contrasting singing styles build a lot of musical tension in his melodies. Mastering guitar phrasing fluency helps you do the same in your guitar playing. Guitar phrasing fluency is the ability to combine all phrasing techniques you know. This creates pitch variation in your guitar licks and makes your guitar solos more creative. Discover the process for composing great guitar solos. Learn how to make your lead guitar solos sound unique. 1. List all guitar phrasing techniques and ornaments you know. (These guitar soloing articles help you do this). 2. Create a short guitar lick (3-6 notes long) and play it over and over. Listen closely to the most important notes. (These notes are: the first and last note of a phrase, and any note that is sustained for a long time). Play some notes an octave higher at unexpected moments to imitate King Diamond’s falsetto. Tip: This works especially well on the last note of a phrase. Harmonize some notes using double stops. Vary the way vibrato is used. (For example: use delayed vibrato or change its speed and width). Apply vibrato on both notes of the double stop (this sounds killer!). Combine several phrasing techniques on one note. Example: play the last note of a phrase an octave higher, harmonize it with a double stop and use delayed vibrato. Practice this pitch variation exercise to train your fluency with guitar phrasing techniques. This guitar solo video gives you even more ideas for writing killer guitar solos. Learn how to create your own guitar solos and become a better lead guitarist fast.